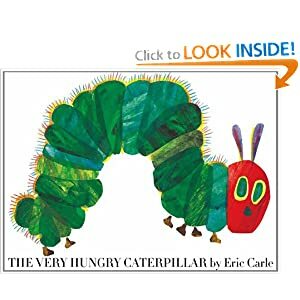 Our book today was The Very Hungry Caterpillar by Eric Carle. After we read the book, Aubrey made a caterpillar. We made the caterpillar in two steps. First, she watercolor painted two pieces of paper. Then, we let them dry. When they were dry, I used a cup to draw circles on the back of the papers. She glued the circles on a paper and gave her caterpillar a face. I love the cute little face!